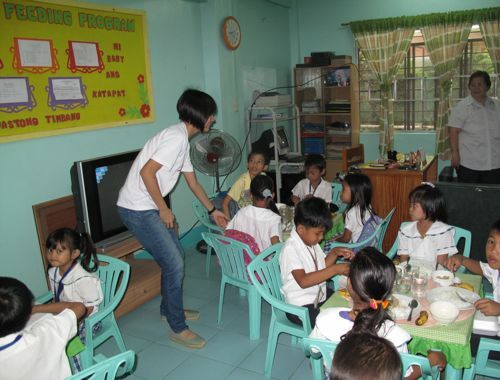 Our crew, the Teen, Mrs. MM and I recently visited the feeding program in Taguig and took these photos. The Teen cooked/baked something for the kids (spaghetti one day, cupcakes another) in addition to their regular meals. She was a bit overwhelmed when she realized spaghetti sauce for like 150 people is a massive amount of stuff to stir, not to mention the noodles! All of the kids on these programs are classified as being SERIOUSLY underweight for their age. They receive three full meals per week, more if the budget allows. All of them wish to express their gratitude and thanks to the generous donors from marketmanila.com, and I can tell you, they mean it from the bottom of their hearts. Unfortunately, this marks the end of the marketmanila.com feeding program for now. The administration, collection of funds, disbursement, monitoring, etc. took a lot of effort, far more than I had envisioned. And several staff helped me in this endeavor and we feel it is time to move on to other things, charitable ones included. I encourage readers to pursue simple basic charitable endeavors whenever possible… they do indeed make a difference. 4 consecutive years is not a joke! MM, readers, and sponsors deserve a big round of applause. a toast to MM and family, the crew and to all the donors and readers! most of all, good luck to all the kids! 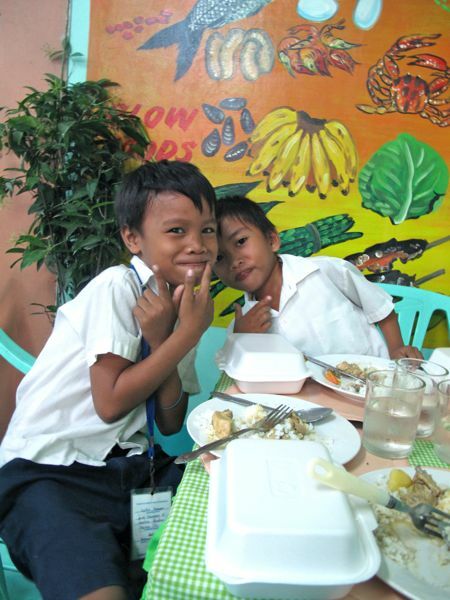 this is so inspiring, and a public school feeding program is certainly on top of my list of things to do soon. hugs to everyone! super like! more power mm! This is amazing, MM :) Thank you for sharing! so no more program? is there any other system in place to continue for donation? Thanks for the opportunity to be able to help even in a small way through this worthy endeavor! I hope the parents of these children will now be able to sustain the healthy feeding of their children after 4 years that they have been in the feeding program. You don’t only share ideas, you also share meals too. God bless you and your family. The plaque speaks for itself. A virtual thunderous applause for MM and family and those who supported the program! Many children and their families will continue to need support like MM’s now recently discontinued feeding program. Hopefully, as the trend for organic farming and small scale farming continues, the Philippines will somehow work its way toward achieving “food democracy” and ease the hunger and poverty that plagues so many. “Food prices around the world are surging. Between July of last year and this January alone, the price of wheat has doubled. Indeed, the cost of food has now passed the record levels of 2008, when angry citizens staged huge protests in dozens of countries. Currently, protesters across the Middle East include lowering food prices among their demands. When prices go up even a bit, millions more people starve. The local organic farmers with whom we have been spending time in the Philippines and elsewhere are less affected by these price swings precisely because they consume much of what they harvest, and they sell the rest to local markets. These farmers have achieved at the household level what Frances Moore Lappé terms “food democracy,” and what the small farmer coalition, Via Campesina, calls “food sovereignty” at a national level. This is just so wonderful! May you continue to be blessed with all things that truly matter Market Manila. I nominated you at http://www.saveur.com/2011-best-food-blog-nominations.jsp for Best Regional Food Blog. You should post a campaign. Nominations end April 22. Best of luck! Just a thought. We have a saying that “walang tumatanggi sa anumang biyaya”, and those youngsters have a lot to thank for in MM’s feeding program, but don’t I wish those kids were partaking of brown rice instead of the white. The children will surely get 30% more nutrients, but then, we have a long way to go to get many to switch to the healthier option. Thailand, Japan and Korea have successfully cultivated and grown rice varieties that have improved flavor and thus palatability. Others who shun brown rice think it inferior and for barrio folks only who cannot afford the polishing in modern rice mills. What a shame. In some households I know, the brown rice was reserved for the house help and servants. Maintaining a blog this good for 6 and a half years is already an achievement… and 150,000 meals for a feeding program is another feat. Congratulations to you MM, your family and staff. May God continue to bless you with good health (and maintain the Daniel Craig shape, haha) for many more years to come. If in the future you will continue the feeding program, let us know, this site is just a click away, anyway! How can we join this worthwhile project? Just now hearing about the feeding program. I want in! May updated donation details po ba kayo? I’m here in the US and, reading through the related posts, si sir Ted ata yung nango-ngolekta ng donations through Paypal? Ang alam ko sa Paypal puwedeng mag-“subscribe” to monthly recurring donations. Hindi ko din sure kung meron na sa Pinas ng similar program pero meron din dito sa US na parang colalition of food banks. Second Harvest yung pangalan. In a nutshell, the cash donations they receive mostly go towards the transportation costs of food items donated by farms and grocery chains (e.g. some canned goods that are still good but have only maybe 2-3 months left on their expiry date). So yung projected “feeding power” of the donation is $1 equals about 2-4 meals. So actually, “more bang for your buck” ang cash donation to them than buying a can of something from the grocery and putting it in a donation bin. iirc, A lot of grocery chains donate their stock (for tax break purposes) and most times the problem is transporting that stock to from the supply warehouses to the food banks. Very nice MM! Bravo and Kudos to you, your crew and your family! congrats, MM! It’s sayang you have to end this now. Anyhow, i just want to say that malnutrition, while greatly caused by low income, is also brought about by poor food choices. I am disappointed that the government, DOH endorses vitamin fortified instant noodles when they can do better at educating people in eating healthy. Why not promote mongo and other natural and healthier alternatives that are just as cheap instead of instant noodles? I singled out mongo coz i was amazed how a small uncooked portion could yield to a large quantity when cooked, thus making it relatively cheap to buy. this is just pure greatness — good job bro! 150,000 meals is ginormous, I can’t even imagine the amount of work that entailed from you, crew, and school volunteers. The meals must also have been an incentive to children from poor families to continue going to school, instead of dropping out. As such, a shame to stop now — but I totally respect your decision. 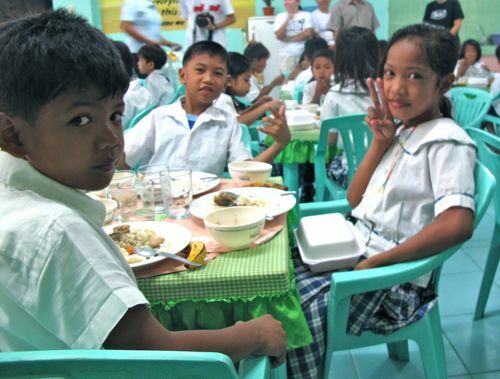 Perhaps readers interested in supporting feeding programmes can donate to groups like Assisi Foundation, a very low key NGO with amazing reach, which supports feeding programmes for elementary school children. I was just thinking if marketmanila still holds its regular feeding program and found this post. It’s a shame that I have been able to donate only once =( – which was like 2 or 3 years ago, as I have carelessly diverted my extra funds somewhere else =|. 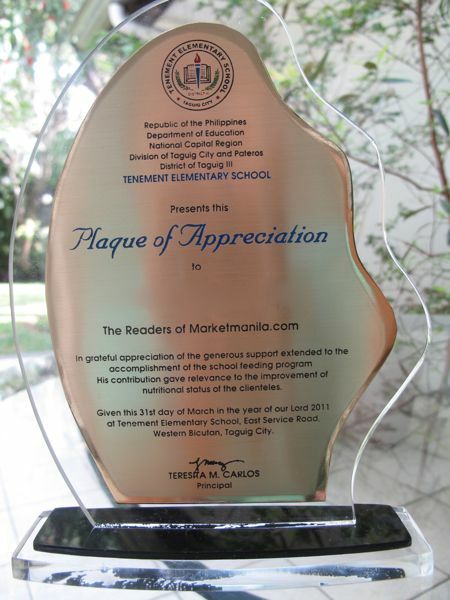 Nevertheless, I would like to congratulate you, MM, and the rest of marketmanila staff and readers!! Hi MM, I have been following your blog for about a year or so now. This particular post caught my attention because me and my friends are just planning to start a long-term feeding program this June, for a community in San Juan. Hope you can share some tips/advice from your 4 years of experience. Thank you and God bless you more!!! kudos to marketman and fellow readers!!! good luck to the next 150,000 meals! Lesley, first you have to have sufficient funds, enough to sustain a program for a reasonable length of time. Second, you may want to involve parents as volunteers to cook the meals to minimize costs. Third, you may have to purchase the equipment needed for a feeding kitchen (stoves, pots and pans, serving utensils, etc.). 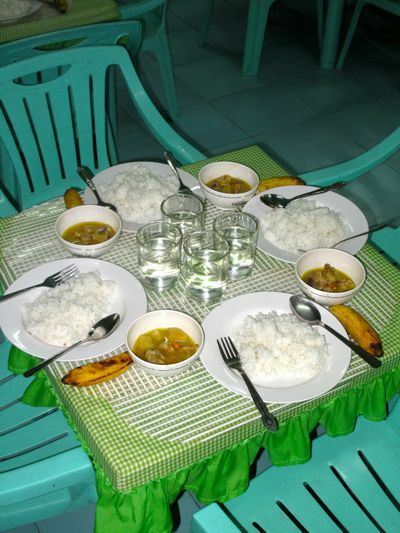 Fourth, you need to outline what the meals will contain (viand or protein and vegetable, rice, fruit, etc.) and cost out an average meal (say PHP20-25 today). Fifth, you need to have a trusted counterpart administer the meals and ensure the recipients are the most deserving. Sixth, the funds have to be released in small tranches to prevent misuse. Seventh, active monitoring and recording of meals served is very useful. 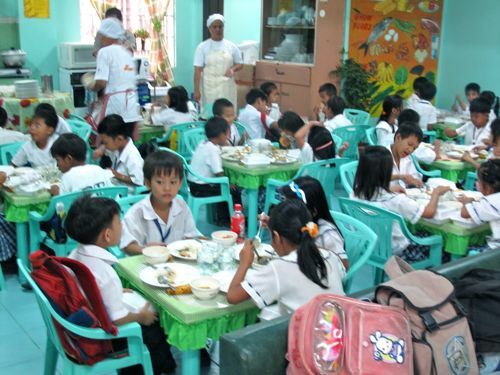 Eigth, continuity of attendance for kids over the school year is important and we found that the meals resulted in a very good improvement in attendance rate for classes. Nina, I agree poor food choices are a serious problem. I can often think of nutritious meals for less money than a fastfood piece of chicken with rice. Why the vast majority of hourly wage earners think they are doing themselves a service by buying fast food is beyond me. In case you plan to do another project, count me in. Is red or brown rice perhaps more expensive because they are produced in lower quantities and/or are the imported better varieties with better palatability index which tend to be more expensive anyway? I know I buy the imported Thai brand in ‘Pinas when I can’t get the specially ordered ones from the rice mill. We should find out why. Yes, we all need better education on the food we put on our tables. This is awesome, you’re such an inspiration, and the reason why i decided to create my own Food Blog. Please send me a message regarding your future projects. I want to help in my own Little Ways! Congratulations, MM, to your family and your staff. Four years of successful feeding program is quite an achievement! i was wondering if you are still holding feeding programs and if you are, would you mind sending me a message on how i would be able to help? it would be a good birthday present for myself.